Lost Artifacts: Time Machine was available as a giveaway on December 2, 2018! How would you improve Lost Artifacts: Time Machine? Sorry folks, slept in until late morning due to a very late night, then ended up chilling out in front of the TV with my kids watching our favorite SCFi and Fantasy programs (Outlander, Shannara Chronicles, 12 Monkeys (the movie and part of the first series), Blood Drive, Aftermath and Black Sails). Totally forgot I'd promised to post something until now. It's much too late to post a full review now. Hopefully we will be getting more games from Falcoware over the coming days, so make sure you check the site out each day. This game is full or problems that they never fixed. You are better of finding Lost Artifacts Time Machine Collectors Edition (MPC) to get the game with no problems and up to Level 60. I did. And I've finished it. Thank you. Lost Artifacts - Time Machine - crashed on Levels 29 (got creative and got past that then 30 32 41 42 also did not work). The 'guy' just stands there on opening and/or most of the items graphics are just not there. Windows XP sp3. Am I the only one? Lost Artifacts - Time Machine - crashed on Levels 29 (got creative and got past that then 30 32 41 42 also did not work). The 'guy' just stands there on opening and/or most of the items graphics are just not there. Windows XP sp3. Am I the only one? WaveThemes, how did you skip 29? This does take 100% of the fun out of the game as you don't get any 'stars' challenges as you have already completed the game. You get nothing out of it but a debugging opp. If it ever gets 'fixed', I'll get rid of the copied player.dat and play the game to the end! Mavadelo, I had already installed and played "Lost Artifacts Soulstone Collector's edition" to the end. In Windows XPsp3 - went to C:\Documents and Settings\MeMyselfID\Local Settings\Application Data\8Floor 1st into folder "Lost Artifacts Time Machine Collectors Edition" and renamed "player.dat" to something else. then went back up to "Lost Artifacts Soulstone Collector's edition" and copied that "player.dat" into Lost Artifacts Time Machine Collectors Edition This does take 100% of the fun out of the game as you don't get any 'stars' challenges as you have already completed the game. You get nothing out of it but a debugging opp. If it ever gets 'fixed', I'll get rid of the copied player.dat and play the game to the end! Short FYI.downloaded and works fine on my Win 10. Thanks GGOTD. I love TM games and both yesterday's game and today's game downloaded for me in less than 9 minutes, as opposed to the usual problems I have where I'm told they'll take 2 or more hours and I'm not able to get the game at all. Thanks to everyone who has helped me with suggestions for better download times. Happy Gaming everyone and my thanks also to My Play City for this game. I love TM games and both yesterday's game and today's game downloaded for me in less than 9 minutes, as opposed to the usual problems I have where I'm told they'll take 2 or more hours and I'm not able to get the game at all. Thanks to everyone who has helped me with suggestions for better download times. Happy Gaming everyone and my thanks also to My Play City for this game. 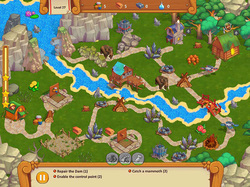 -The first 9 levels to be very slow-paced, but once you reach Level 10, you can "speed up" the little guys and the play becomes much more interesting. -The music isn't annoying - actually, not too bad - but the slow melody detracts from the play, IMO - I prefer something that's faster-paced, as you are racing the clock. -Didn't find a way to play without it being timed, which wasn't a problem on most levels. -It's hard to see when the "crops" are ready for harvest, as there are only 4 plants per garden - it would be nice if they filled the space when ready for harvest, as do other games of this type. -The sounds aren't intrusive (as in some games). Thanks as always for this free game, Whiterabbit & GGAOTD! In a couple of words: Time Management game. You collect food (looks like fast food burger/fries/drinks!) and wood and metal, clear away fallen branches and spear pits and mantraps, etc. 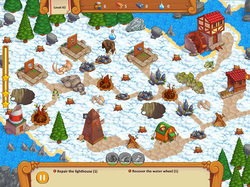 The graphics look clear and cheerful, based on the first three levels. But a HUGE flaw: there doesn't seem to be any way to start over on a level if you realize you've made a mistake, other than waiting for the entire time allotted to pass. 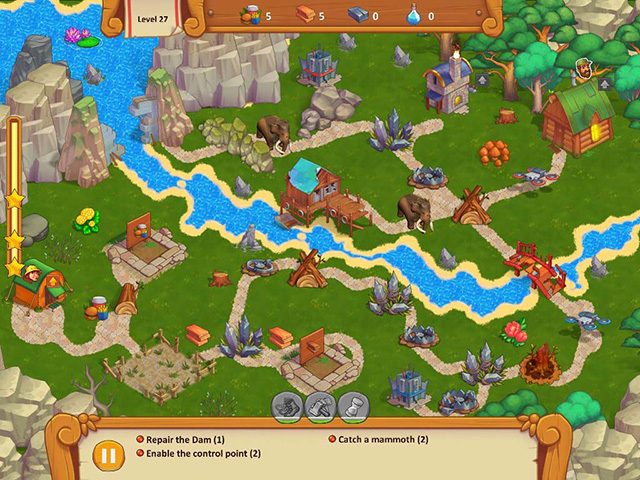 For example, I failed to make restoring a farm one of my first moves on Level Three. Food is required for every task above the level of collected resources lying on the road, INCLUDING building farms. So if you didn't get the farm restored, you simply cannot make any other progress on the level. Every other game of this type I've played allows you to restart a level at any time. This one doesn't. (At least, that I could find.) So my choices were to sit there and twiddle my thumbs until the clock ran out, or use the task manager to bail out of the game entirely. Way to kill the fun, IMHO. In a couple of words: Time Management game. You collect food (looks like fast food burger/fries/drinks!) and wood and metal, clear away fallen branches and spear pits and mantraps, etc. 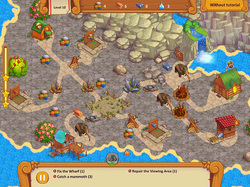 The graphics look clear and cheerful, based on the first three levels. But a HUGE flaw: there doesn't seem to be any way to start over on a level if you realize you've made a mistake, other than waiting for the entire time allotted to pass. 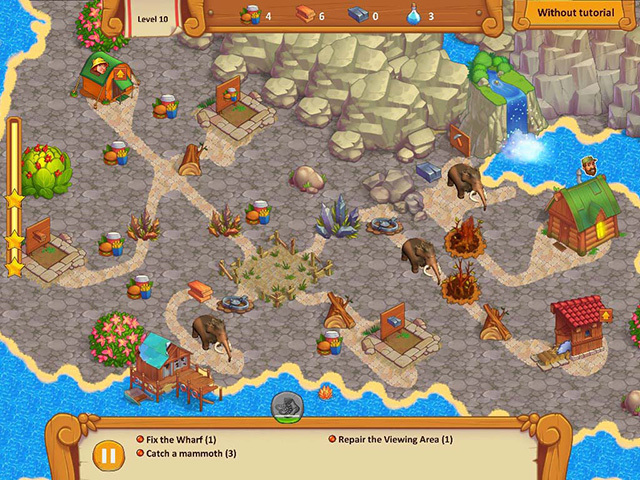 For example, I failed to make restoring a farm one of my first moves on Level Three. Food is required for every task above the level of collected resources lying on the road, INCLUDING building farms. So if you didn't get the farm restored, you simply cannot make any other progress on the level. Every other game of this type I've played allows you to restart a level at any time. This one doesn't. (At least, that I could find.) So my choices were to sit there and twiddle my thumbs until the clock ran out, or use the task manager to bail out of the game entirely. Way to kill the fun, IMHO. Hi Susan Canera, click on Pause - that will give you the option to Restart. Until Whiterabbit-uk gets here, I just thought I'd share what I found. The release date on this game is Nov 2, 2018 so looks like it is brand new. Nice of them to share it here for free! I could not find any online reviews but MPC lists it as "Categories: Kids; Time Management". Lost Artifacts: Time Machine is an exciting strategy game about time traveling. TM is not my thing so I won't be downloading but thanks to all involved for the offer! Thanks JBoy. Needed to take a break today. Slept in until late morning after a very late night.Then chilled out playing my favorite RPG (The Elder Scrolls Online) and catching up on various programs I'd recorded over the last several months. (Shannara Chronicles, Outlander, Black Sails, Blood Drive, 12 Monkeys and Aftermath) Not watched so much TV in ages. The comments were empty when I got here and I was curious about what genre of game it was. After searching online, I thought to just copy and paste a bit of what I found that might inform others. No biggie. Sounds like you had a nice chill day. Good for you! You're welcome, Stephen! The comments were empty when I got here and I was curious about what genre of game it was. After searching online, I thought to just copy and paste a bit of what I found that might inform others. No biggie. Sounds like you had a nice chill day. Good for you! If i had more notice from the giveaway team, I'd be able to prepare reviews well in advance, but that rarely happens, and I'm usually given less than a days notice..
Game doesn't work on Windows 10 - opens, changes the custom cursor but the screen stays black. I found the game for free on MyPlayCity's website and downloaded it there and installed it over the giveaway copy. Then used the .exe that was generated from the giveaway install and now the game works. Kermit, I found the game for free on MyPlayCity's website and downloaded it there and installed it over the giveaway copy. Then used the .exe that was generated from the giveaway install and now the game works. In WinXP_VM it did not start due to graphic-card. Kermit, I did not have any trouble in Win10-x64 Pro In WinXP_VM it did not start due to graphic-card.